Spacious living rooms are perfect at the end of the day. Kick back and let it all hang out. Gentle breezes help cool you down as you workout. You can watch nature's light show from the pool. You're surrounded by three golf courses. 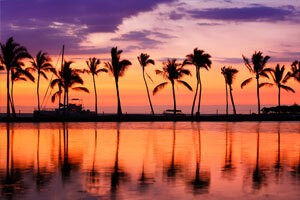 The resort is nestled in the laidback Waikoloa resort community. The gorgeous condos of Castle Halii Kai at Waikoloa are set within a resort community. All residences are right along the golf course, sure to satisfy the players in your group. You’re about a mile from Waikoloa Beach where you can swim and snorkel. Don’t bother unpacking once you get to your condo, just get changed into swimsuits and slap on some sunscreen before heading to the pools. Work on your backstroke in the cascading heated pool or set up camp with a cocktail from the poolside bar while the little ones splash around in the children’s pool. Tennis players will appreciate the courts located on site. Get your cardio on at the oceanfront fitness center. Looking for a tasty meal? Head to the Ocean Club Bar and Grill for a casual meal crafted with local island ingredients. Or take advantage of the on-site BBQ grills for a family cookout. Recruit the kids to help carry side-dishes and condiments. Air-conditioned one- to three-bedroom condos sleep four to eight guests and offer ocean or garden views. Get in touch with your inner-Betty Crocker and bake up a batch (or two) of your famous chocolate chip cookies. The children will be begging to assist - and make sure the cookies have enough chocolate chips. The in-suite washer/dryer will definitely come in handy for post-chocolate cleanup. When the cookies are done, enjoy them while you catch a sitcom rerun on the Flatscreen TV, it has Cable. Later, take advantage of your DVD player for family movie night. Bring favorite movies from home, pop some popcorn and call everyone into the living room. First kid on the couch picks the movie. Need more space? Upgrade to a premium two bedroom condo or a three-bedroom townhome. Split your crew into two groups: golfers and shoppers. Castle Halii Kai at Waikoloa is adjacent to two championship golf courses. The Trent Jones Jr-designed Beach Course is an eighteen-hole course that opened in 1981. The King’s Course is a Scottish links-style course designed by Jay Morrish and Tom Weiskopf and is more challenging than the Beach Course. Shoppers will love King’s Shops and Queen’s MarketPlace. They are both just a short drive from the resort. King’s Shops feature Michael Kors, Tiffany & Co. and Macy’s along with The Walking Company, Tommy Bahama and Sunglass Hut. When you get hungry, there’s Island Fish & Chips, A-Bay’s Island Grill and Roy’s Waikoloa Bar & Grill. Queen’s MarketPlace has Quicksilver, Volcom and Island Pearls. Tweens will love Claire’s. Get your caffeine fix at Starbucks. Paradise Pizza & Grill or Ramano’s Macaroni Grill will be happy to welcome you when it’s time to eat. - The front desk is open from 8:00 AM - 8:00 PM daily. Guests that are planning to arrive after 8:00 PM must contact the property in advance using the information on the booking confirmation to receive an email with a code and detailed information on how to get into the unit. This exclusive resort community is home to the best beaches and golf courses on the sunny side of the Big Island. It's set away from the crowds and perfect for pure relaxation, although a little farther from shopping and dining.